Sage Live | What can it do for your business? 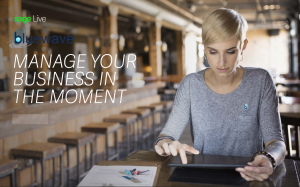 So what can Sage Live and Bluewave Technology do for your business? Free yourself from your office desktop where your accounts package lives. 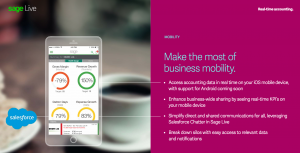 Get access to all your important finance information on your mobile device with Sage Live. 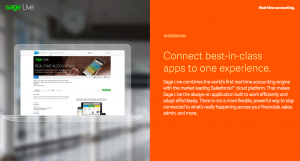 Sage Live has been built on the Salesforce Platform, integrating tightly with with the Worlds No.1 Cloud CRM System. However, there is no requirement to already be a Salesforce Customer to leverage the benefits that Sage Live has to offer. 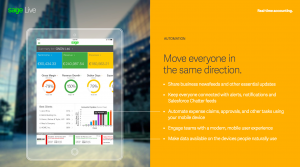 Get access to your finance reports on the go. No longer will you have to request finance reports such as debtors lists or bank reconciliation reports to be emailed to you from the office. Simply check your mobile device and view the relevant report or live dashboard so you can make decisions instantly. All in real time, from any connected device. Run you entire business process on one platform in the cloud. From first contact with a prospect, to quoting for a deal, receiving an order, invoicing and collecting cash, you can see it all, live on the Salesforce Platform. Let your accounts information help you make a decision during your sales process. Understand your customers payment profile when agreeing terms and conditions on a deal. All the information will be at your fingertips with out the need for static reports. Help your employees save time by removing slow manual tasks from their day. Sales people can add their expenses directly into their mobile devices, updating your financial information instantly. Get the information that matters to the people it matters to. Utilise Salesforce Chatter to get alerts and Newsfeeds to different team members so they can make better business decisions. Bluewave Technology Group will help you implement Sage Live whether you are moving from an existing accounting package, exel or are setting up an accounts package for the first time. Get our product features and pricing brochure and watch our overview video by filling in the form below.